CAYSTON is taken as an inhaled breathing treatment with the lightweight, quiet, and portable Altera® Nebulizer System. Note: Do not use any other nebulizer for your CAYSTON treatment. CAYSTON nebulization time is typically 2-3 minutes,* 3 times a day, at least 4 hours apart. One course consists of taking CAYSTON 3 times a day for 28 days, followed by at least 28 days off CAYSTON, as directed by your doctor. Note: Once you remove your CAYSTON and saline from the refrigerator, they can be stored at room temperature (less than 77°F) for up to 28 days. 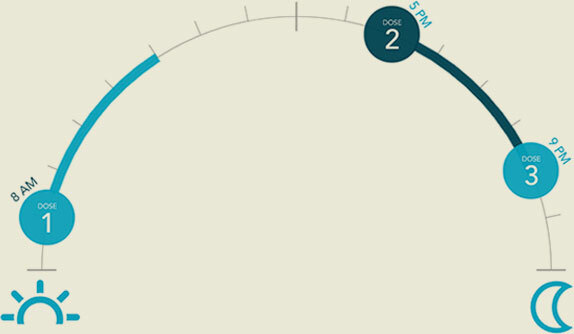 See how CAYSTON may fit into your daily schedule with our interactive dosing tool. See the sections on Preparing CAYSTON, How to Take CAYSTON, and Cleaning and Disinfecting for more information on taking CAYSTON with the Altera Nebulizer System. You can also view helpful videos in the CAYSTON Resources section. This 2-3 minute estimate does not include setting up, cleaning, and disinfecting your Altera nebulizing equipment.